Ciara Mageean eased into the 800m final at the Irish Championships in Dublin as she continued to press her claims for World Championship selection. The Portaferry woman won her heat in 2:11.95 as she was ahead of Laura Crowe and another northerner Aislinn Crossey. Mageean is in the entries for Sunday's 1500m straight final but it remains to be seen whether she double up. 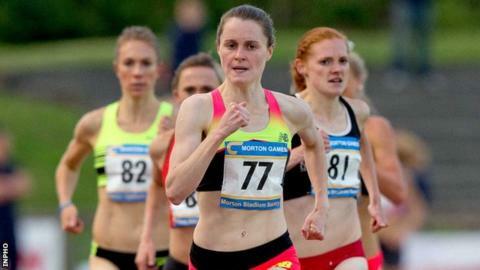 World Championship and Olympic qualified steeplechaser Kerry O'Flaherty is also set for the 1500m. The Newcastle woman opted out of her specialist event on Saturday as Sara Treacy took gold ahead of Letterkenny athlete Ann Marie McGlynn. Treacy has achieved the Olympic 3000m steeplechase standard but has not managed the World Championship mark and was thwarted in that ambition in Saturday's final as she was just under the 10-minute mark. Mageean is one of a group of Irish athletes currently in line to compete at the World Championships despite not having achieved qualifying standards. New rules state that the IAAF will select non-qualified athletes from this season's rankings after the entry period closes on 10 August. Mageean's 1500m season's best of 4:08.32 is currently inside the top 45 in the rankings who, subject to eligibility, will be invited to compete in China. Elsewhere, Donegal man Mark English earned a comfortable 800m heat win in 1.53.84 as he prepares for Beijing. North Down's Laura Saulters took triple jump bronze with a best of 11.43m while Strabane's Sean McBride took javelin gold in 63.21m. In the sprints, Amy Foster won her 100m heat with Ulster duo Dean Adams and Jonathan Browning progressing along with favourite Marcus Lawler in the men's 100m.